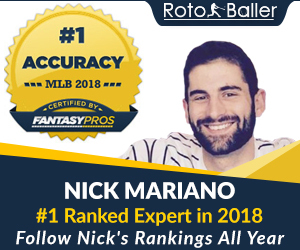 For the first time in the history of fantasy football and the internet, RotoBaller is offering LIVE expert fantasy college football advice with our chat room below! And it’s all free. Have fantasy college football questions? DFS lineups for FanDuel/DrafKings, draft advice, sleepers, trades, waivers, starts/sits – ask anonymously, and get live advice asap. You can also create your own chat room username by registering for free on the top right of the site or clicking here. Make a call to the RotoBaller chat room and get some real-time fantasy college football advice. Please be sure to follow these guidelines so everyone is having fun. We love great college football banter… what we don’t love is chats that stray from these guidelines. No spamming or trolling of any kind, including being disruptive to others. No solicitation of any kind. Do not promote your site, service or brand here. No impersonating staff writers, or pretending to be RotoBaller staff in any way. There are no stupid questions. We have fantasy rookies, veterans, and gurus who all come here. All fantasy questions are good ones – even if they are repeats. Keep it friendly, chill, and sports related. We are all here for the same reason – to get advice, give advice, banter around, and win our fantasy leagues! No cursing, profanities, racial slurs, lude comments, or inappropriate remarks are allowed. Let’s keep it clean & fun! Personal attacks, name calling, antagonizing of other users will not be tolerated. Everyone please be respectful to one another. We want our chatroom to be fun for everyone. But if RotoBaller.com staff notices any of the above behavior, or are receiving complaints, we reserve the right to ban any user permanently from the chat room. Now let’s win some leagues! Above is our main Fantasy College Football & DFS chat room, it may take a few seconds to load so hang in there. If you look on the bottom right of your screen, you will also see the RotoBaller Live Chat window. After you click on it to open, there are other public chat room areas called BASEBALL CHAT ROOM, FOOTBALL CHAT ROOM, and others. Get involved with some college football talk, ask your fantasy questions, read other discussions, or feel free to chime in and reply back with your own 2 cents. Remember you can ask the RotoBaller staff any questions, and we'll reply back to you as quickly as possible. You can also chat directly with RotoBaller by clicking on our name, or directly with any other users on the site! In today's fast-paced fantasy landscape, you need the fastest possible advice, and nothing could be faster than LIVE REAL-TIME CHAT. By visiting our website, you can for the first time access EXPERT fantasy advice in real time! Need to know which sleepers to target on draft day? Wonder whether you should start one of your guards or centers? Questions about game-day injury news? Just click on over to RotoBaller's LIVE CHAT and pose the question. No other site offers this kind of customized, instant-gratification response to your unique fantasy needs! 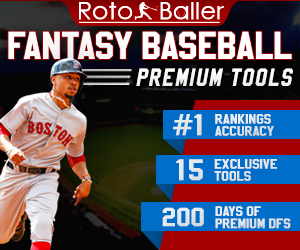 Check it out today... Stay Informed, Stay Connected, Be a RotoBaller.